More freight traffic carrying hazardous materials, including Bakken crude oil, is moving on CSX's River Line through the Hudson Valley. The CSX freight train that crashed into a car just north of Bear Mountain last week served as yet another reminder of the danger on the rails. Sixteen cars on the 121-car train were carrying hazardous materials but none of them left the tracks or spilled any of their contents, which included commercial chemicals such as hydrogen peroxide, sodium hydroxide, hydrochloric acid and sulfuric acid, CSX said. There was no Bakken crude oil on board in Wednesday's crash. The volatile liquid has been known to ignite and explode following train derailments or collisions. Town of Highlands police suspect a 51-year-old Highland Falls woman intentionally parked her 2012 Toyota in front of the train, which was approaching Rockland en route to North Carolina. She drove around gates on Mine Dock Road in Fort Montgomery, Police Chief Jack Quinn said. The nearly mile-long train was traveling at approximately 30 mph when it hit the car and pushed it back about 350 feet, part of it into a tunnel. It took the train nearly a quarter of a mile to stop. The driver was taken to Westchester Medical Center in Valhalla with head injuries. Quinn said police officers and firefighters are well aware of "the contents of these trains that are going up and down our shoreline." While emergency personnel headed to the scene Wednesday, the 911 dispatchers contacted the railroad. "One of the first questions they ask of CSX is, What are we dealing with here?" Quinn said. Increasingly, trains hauling the oil in outdated tank cars are becoming a common sight on CSX's River Line, which passes through four of Rockland's five towns. Approximately four to five trains, each carrying millions of gallons of crude to refineries to the south, travel the line from upstate Selkirk. Rockland Fire and Emergency Services Coordinator Gordon Wren Jr. said he was reminded of December's incident in which an empty oil train hit a car carrier at a crossing in West Nyack. 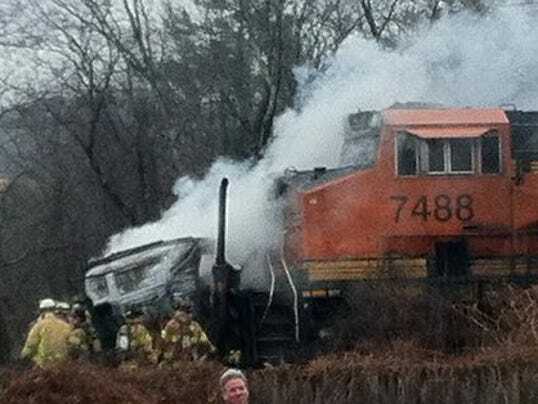 The train didn't derail but first responders said the incident could have turned tragic. "The stakes have always been high," Wren said. "The Bakken oil thing has just put a spotlight on the issue." A series of high-profile incidents involving oil from the Bakken shale formation in North Dakota has raised concerns in the United States and Canada. The federal government is in the process of enhancing standards for the tank cars most often used to transport the explosive oil. The state Office of Fire Prevention and Control has released a quick-reference guide regarding how to battle a Bakken crude oil fire. "It can affect any department in any county," Wren said. CSX spokesman Rob Dolittle said the railroad is also working to get information to first responders more quickly in the event of an emergency. It recently launched a mobile app that provides high-level emergency officials with real-time information about the content of a train. The information is available through its SecureNOW system, which New York state-level emergency agencies can access. It's also training more firefighters. Althea Mullarkey, a public policy analyst with the environmental group Scenic Hudson, said the region "got lucky" that the Orange County crash didn't turn into something far worse. "The fact is the more traffic you have the higher chances you're going to have an incident," she said. "We need to make sure every single place where trains can possibly interact with humans needs to be as safe as possible." My heart goes out to this woman in emotional pain who didn’t know or think about the risk to other people and the environment. I love Highland; and I’d hate to see it and the Hudson ravaged by toxic chemicals and fire. These materials being transported are simply unsafe. Let’s find alternatives! Are there no safety features on these railways? Cameras? Sensors? Patrols? Come on, technology has reached heights. These big companies transporting these toxic substances can foot the bill. Or, we can ban the extraction, manufacture, transport, and processing of these toxic materials!! Now we are at risk from “crazies”, suicides, and domestic terrorists. We were lucky this time…..
See, it doesn’t matter the precautions in place, something can always go wrong. Even IF the tank cars were made safer, and there were more engineers on board per shift, and all the tracks were inspected regularly, There are always matters beyond the control of the railroad. We simply MUST get the bakken crude off the rail and kept in the ground. This was a serious train accident. It could have been the Bakken. The train could have derailed dumping the many hazardous materials on board. With the huge increase in train traffic, we’re bound to have more and more accidents.